The season of Advent begins this Sunday. It is meant to be a time of reflection; that's why churches are stripped of flowers and other decorations during Advent, so that we can clear the clutter away and think about ourselves and our world. But the reality is that, amidst all the pressure to shop, spend, cook and party,it is often even harder to to find any space to think or to pray than it usually is. Like Bethlehem when Mary and Joseph arrived, there seems to be no room for any new arrivals in our lives. But as they trudged through the streets looking for a bed for the night someone remembered that there was an animal shelter where they could be squeezed in. Someone thought creatively and wondered whether a manger might do as a crib for a very new baby - it might not come Mothercare recommended, it might not be ideal, but it would be safe and warm. Perhaps we look at our lives with a shrug of resignation, feeling that there is no way we can make them the oases of calm reflection we would like them to be. But God does not give up on us as easily as we give up on him. It may not be much. It may not be perfect. But even five minutes to sit still now and then can be enough - a manger for the Christ Child who comes with hope and love into our lives. If you'd like some suggestions for keeping Advent - making space for God - there are some ideas here. Has anyone seen our plinth? You may have noticed if you have been through the churchyard recently that the stone plinth on the left hand side of the path has gone missing (pictured left). It once had a sundial on the top, but that disappeared some time ago. 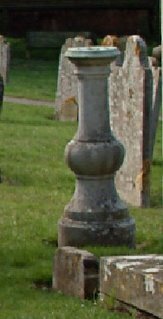 It was about 3 or 4ft tall and made of solid stone – quite substantial. We have reported it to the police, who are looking for a thief with a hernia …! All that remains is the stone base, with some metal bolts sticking out of it. We will make these safe as soon as we can, but in the meantime, please take care not to trip over it if you are walking across the churchyard. And if anyone offers you a handsome garden ornament like this, please let us know…! We are keen to recruit some new volunteers to the flower arranging rota – either to help on a regular basis or for major festivals. You don’t need to be an expert to do this –just willing to turn up and help. Contact meif you would like to help. I’m planning a monthly “Pre-school worship” service for the under fives and their parents or carers. This will be a VERY informal mix of songs, stories and activity, followed by refreshments, in the church hall every fourth Friday in the month, from 1.30 – 2.30. The first session will be on Jan 26th. If you, or someone you know might like to come along, just turn up on the day - you'll be welcome. Many thanks to all who contributed to our Remembrance Sunday service this year. The British Legion, as ever, turned out in force - reading the lessons, parading standards and laying wreaths. Seal's firefighters were there too, sitting, as always in the back pew, so they could make a swift exit if they were called out! The Parish Council was represented - many thanks to them for organising the cleaning of the war memorial, which now gleams brilliant white! There was also an exhibition put together by Marie Bloss and Colin Milligan, of their researches into the names on our war memorial, giving a little more of the stories of the individuals behind the names and what had happened to them. The "home team" did us proud too, with a lovely anthem from the choir, and arrangements of poppies from the flower arrangers. This is a difficult time of year for many - raising painful personal memories, and painful questions too about the rights and wrongs of war. People come with many different memories and agendas; there are ex-servicemen and women, those who lost relatives in times of conflict, and those whose direct experience of war is limited to news reports. There are all shades of political opinion around too, especially about current conflicts in Iraq and Afghanistan. But Remembrancetide, it seems to me, is a time for silence, rather than speech, a time to be reticent about attempting to provide easy answers to these questions. Each person needs space to listen to what is going on inside their own hearts, and to listen for the voice of God which calls us each in different ways to help in the building of his kingdom. It is a time when we should hear each others' stories and respect each others opinions and experiences, which is why I am so grateful for all the different contributions that were made to our observation of this Remembrance Sunday. I hope that everyone who came went away with something to think about which would help them go forward. There has been much discussion in the press this year about the wearing of white poppies alongside or instead of red ones - a custom that goes back to the 1930s and which was started by men and women who had served in WW1 or lost husbands, sons and fathers in the struggle. You can read more here if you'd like more information - inevitably much of what is said in the press is headline grabbing and sensationalist, usually providing more heat than light! The history of the red poppy as a symbol of Remembrance is here as well as some other useful links. In my sermon on Remembrance Sunday I referred to the organisation Combat Stress, which helps service personnel who have mental health issues as a result of war. You can read more about them here. It was a hectic weekend! 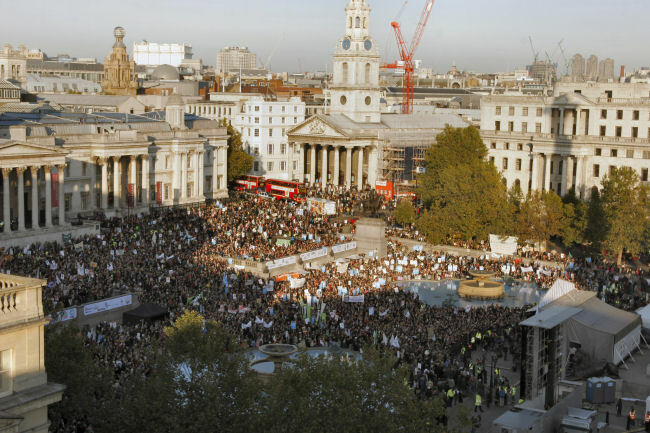 On Saturday I went to the Climate Change rally in London - along with about 25000 others! There was a packed service in St Martin in the Fields, during which we were all given an ice cube to hold , which, of course, slowly melted all over the church floor... (an effective but messy reminder of the fragility of our climate!) The Bishop of Liverpool spoke movingly about the need to address climate change, and especially of its impact on the poor. Our failure to care for the earth was undoing God's work of creation, destroying what he had made, things which he had said were"very good" ( Genesis 1). In effect, we were also working against him instead of with him. It was a powerful event, and I'm glad I was there. 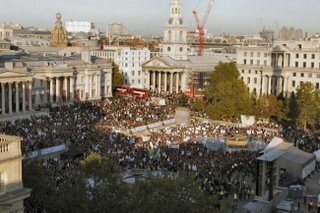 You can find out more here about the day, and about what we can all do to prevent climate change running out of control. 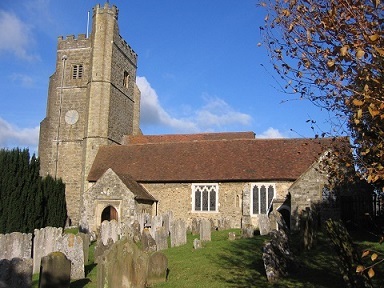 On Sunday, three of our young people, Sophia, Laura and Jess, were confirmed in a service at Westerham church by the Bishop of Rochester. 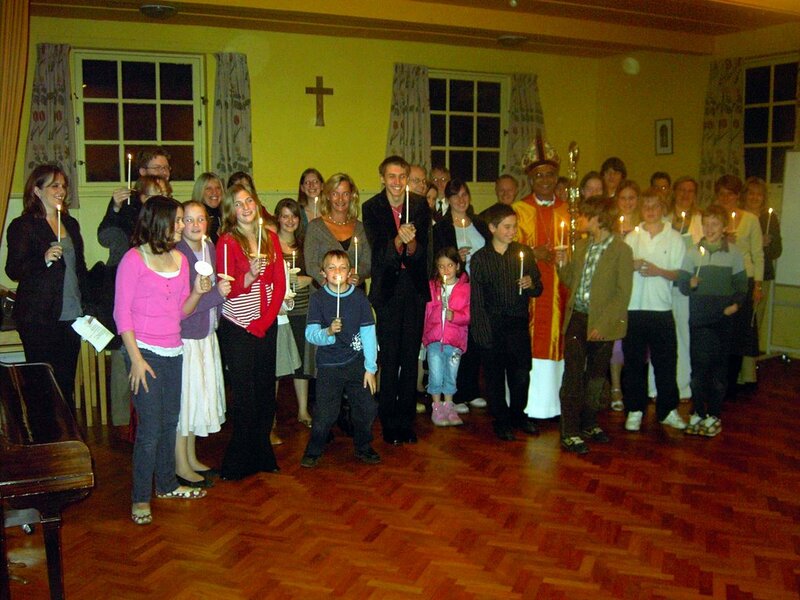 Here's a picture of all the confirmation candidates , taken in the parish hall in Westerham. Congratulations to them all on this new step in their Christian journey. On their behalf , and in the name of the church, I gave a gift via Oxfam of text books to children in the third world. 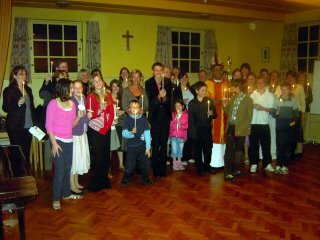 It seemed more sensible than giving the candidates a worthy tome that they would probably never read, as well as a reminder that in confirmation they are commissioned, as we all are, to go out and shine as lights in the world, giving what they have been given. Thanks to all of you who have come along to this course over the last few weeks. We have had some interesting discussions as we have come "face to face" with God, Jesus and the Bible, discovering, I hope, a bit more about our own faith along the way. The course will be repeated in January (probably 11th, 18th and 25th) in the afternoon (1.15-2.45 pm). More details later!